This exhibition is free with the purchase of a permanent exhibit hall ticket. The elemental beauty of gold has inspired mankind for centuries. Over time, this gleaming yellow metal has been used for purposes both practical – with applications ranging from hard currency to stunning jewelry – and fantastic: gold has been credited with causing levitation and curing bubonic plague. One of the most famous gold nuggets ever found is at the Houston Museum of Natural Science. 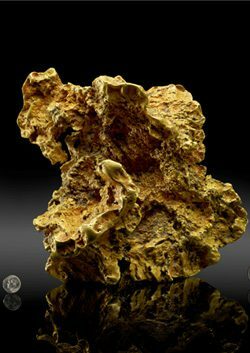 The newly discovered Ausrox Gold Nugget, a true rock star in the gem and mineral world, is inside the Cullen Hall of Gems and Minerals permanent exhibition. Tipping the scales at about 748 troy ounces, or 62.33 troy pounds, (1 troy pound equals 12 ounces), the Ausrox Nugget is one of the world’s largest. Incredibly, this treasure was discovered by three miners using a hand-held metal detector. The Ausrox Nugget was discovered in the Eastern Goldfields of Australia in April 2010. While the bullion value of the nugget is already substantial, the size and rarity of the Ausrox Nugget combine to make it worth many times this amount in the collector market.